With the new release of Adobe Creative Suite 6, I thought it would be cool to create some vector icons. Enjoy! I’m starting to see a lot of these charts used on websites I frequently visit – such as Dribbble pro account page and Carbon Ads Dashboard. Here’s a list of 5 popular ones worth checking out. I just received the new .net magazine – Summer 2011 and found a very helpful article called “The Top 25 Browser-Based Tools” and I thought it would be great to put in a list format with links for our readers. I was recently invited to join Dribbble and am proud to be a member of such a great community. Here are some of my recent “likes” from the website. CSS3 is the latest version of the CSS specification developed by the W3C and includes many exciting features such as rounding corners, adding drop shadows and skewing/rotating elements. Don’t let old browsers hold you back from using the newest CSS3 properties on your websites. Many designers and developers are still creating websites for the primary browser – IE, but there are a lot of good resources out there to make your websites cross-browser compatible. Below are some great tools and tips to guide you along the way! Forrst – inspired by micro-blogging services like Tumblr and Twitter – is a place for designers and developers to share inspiring code, screenshots, and links with their peers. In order to keep the quality of the community as high as possible, Forrst employs an invite-only model for new users. As a designer, typography is a very important aspect to my work. Now as far as print design, implementing any form of type isn’t a problem, but when it comes to the web then there’s only a certain amount of fonts you can use, right? WRONG. 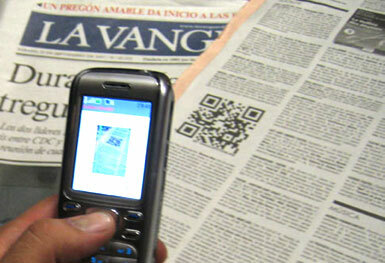 Recently I was introduced to the unusual concept of QR Codes. As this opened a whole new world to me I started looking for more information on the use and success of these mysterious codes. No matter how much information I find, there are still many questions left unanswered. Billings offers an easy way of tracking time from any application using the convenient menubar timer, one click invoicing, alerts for overdue balances, 30 attractive templates to use for your invoices, and an iPhone app coming soon and much more! I’m sure at some point you’ve all noticed a toolbar located at the bottom of a website. Sometimes I don’t like how they look, but I’ve personally used Wibiya on my own site, TheWebBlend.com because they do offer some great features that can dramatically increase your number of visitors and page views. Installing one of these toolbars is fairly simple (and just as easy to uninstall) so why not give it a shot if you’re curious?